Planning only matters if it makes a difference to your congregation’s work. If, after a weekend of planning, staff and volunteers wake up Monday morning and do what they did before, then all your planning was for naught. Grand statements of mission and vision have no value unless someone turns them into action steps. One good guide for writing action plans is to use SMART goals—Specific, Measurable, Attainable, Realistic, and Time-bound. On Monday morning, when you’re wiping sleep out of your eyes, SMART goals tell you what to do and how to know you’ve done it. But SMART isn’t everything. For an institution, SMART goals are at the bottom of a multi-level set of planning statements. Action plans are where the rubber meets the road. But for a governing board writing a top-level plan, SMART goals are dumb. Boards have the duty and authority to set overall direction—to say what the congregation means to accomplish and for whom. At that higher level, goals are and should be abstract, open-ended, and hard to measure. That’s as it should be. Most of what a congregation should produce—inspiration, education, motivation, comfort, mutual support, and social action—can only be attained by trial and error. The board can say what results it wants and why, but how is the province of the paid and unpaid staff—paid and unpaid workers—who set daily goals in support of the board’s goals, pay attention to what works, and try again. It’s a mistake for the board to make its plan too SMART. Board members who are used to practical, results-oriented work must learn to use a different, non-SMART kind of language to express the results of planning. The mission statement says what difference you intend to make in people’s lives. The best mission statement is not a catalog of every program and activity. Instead, it says whose lives we mean to change and in what way. A mission statement should leave many questions about how unanswered. 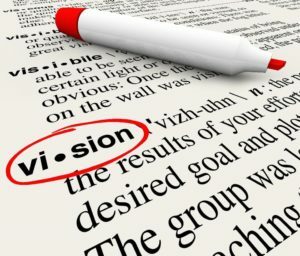 A vision statement draws a picture of a hoped-for future. It says, “How will our congregation and the world around it look, once we’ve succeeded?” A vision statement points ahead to a specific future moment, typically one to ten years out. The emphasis is on what the result should look like, not how we’re going to get there. A long-range (or strategic) plan announces major steps the congregation has decided on to realize its vision. Where must we be located? What worship should we offer, in what language, for what purpose? What priorities will guide our staffing, program, public outreach, and stewardship of funds and property? Strategic planning is about how, but only at the topmost level. SMART goals come last, because they detail the steps each person will take to implement the plan, realize the vision, and achieve the mission. SMART goals belong not to the board—which usually is responsible for other planning products—but to the staff. Ideally, each SMART goal belongs to one named person. Generating and coordinating SMART goals for each paid and unpaid member of the staff is an activity for managers and teams. Not every congregation needs all of these statements—in fact, churches and synagogues got along for nearly two millennia with none of them. But if I could choose just one, it would be a vision statement—specifically, the one I call the Annual Vision of Ministry. The AVM lists one or two or three priorities—major steps the congregation means to take toward the fulfillment of its mission. To be honest, if I had to choose between a congregation with a great mission statement and one whose leaders know its current top priorities, I’d choose the latter. A good mission statement can be inspiring, but a concise list of mission-driven goals helps everyone decide what to do today, tomorrow, and the next day. The AVM is a mid-level planning document. A well-crafted AVM is abstract enough to connect with the congregation’s mission, concrete enough to guide decision-making, and decisive enough to focus resources. “Abstract” is not the same as wishy-washy. The AVM says Yes to some things, No to others. That’s what it means to set priorities. We will advance our ministry with 6–12 grade students to support their spiritual formation and encourage them to form their own connection to church and faith. This statement highlights one area of ministry. It allows for flexibility about what “spiritual formation” and “connection to church and faith” might mean. But it requires the pastor to define these concepts and direct resources achieving them. At the end of the planning period, the board will expect the pastor to show evidence that young spirits have been formed, faith deepened, and connections made. We will create a process for each visitor and member to find a place within the congregational community. This statement, too, selects one priority from among many possibilities and notifies the congregation and its leaders that helping people find their place—hospitality, recruitment, social life, and so on—will come first this year. Over the last several years, our Church has assembled a first-rate staff team. In the process, our expenses have gotten ahead of our financial giving. This year we intend to move decisively toward paying our own way by reducing our budget deficit by half. The emphasis, again, is on the ethical and spiritual goal of “paying our own way responsibly,” rather than on finding new revenue or cutting costs. Those specifics are left to the staff to recommend, their job made easier by a clear mandate. None of these goals is SMART. All, in fact, are resolutely dumb. The AVM does not say how success is to be measured, for a good reason: at this stage, nobody knows. What the governing board can know—in partnership with the clergy leader—is what part of the congregation’s mission it intends to achieve this year. Implementation is different. Staff—paid and volunteer—will choose some sure-fire practices and programs and attempt others in the spirit of trial-and-error learning. In the process, they will fill up their to-do lists with SMART goals. In doing so, they benefit from what their governing board has given them: a clear statement of the mission-oriented purposes they must accomplish to be deemed successful. Dan Hotchkiss consults with congregations and other mission-driven groups from his home near Boston. 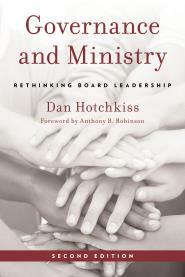 He is the author of the best-selling Alban book Governance and Ministry: Rethinking Board Leadership, which has helped hundreds of churches, synagogues, and non-profit organizations to streamline their structure and become more mission-focused and effective.